Ancestors: The Humankind Odyssey is, according to director Patrice Désilets, "the story of us." 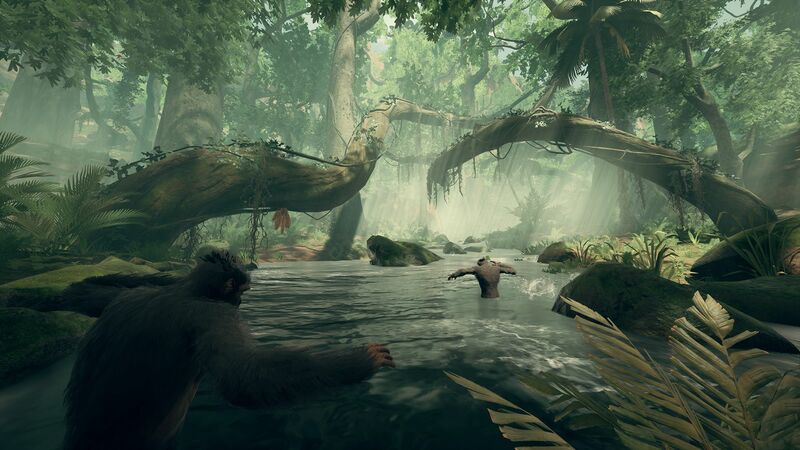 Panache Digital Games' adventure-survival game follows the path of human evolution from approximately ten million years ago up until two million years ago. As you might expect from a game about our species' growth, surviving and (eventually) thriving calls for a lot of trial-and-error. Ancestors isn't interested in making your evolutionary journey easy, either. It lacks clearly-stated end goals, crafting menus, markers, or even any kind of map. Early in the game, your best defense against predators is your reflexes and praying saber-tooth tigers can't climb trees as well as you can. Your budding human intelligence and animal senses allow you to gradually acquire the skills and tools you need for evolution, but otherwise there's no clearly-marked path for you to follow. "No two sessions [of Ancestors] are the same," Désilets tells me during a recent interview at Panache's studio in Montreal. "What you saw is just the tip of the iceberg." It's not hard to understand why two people might have very different experiences playing Ancestors. It's a huge digital jungle gym with 52 square kilometers of wild terrain to explore, and you're encouraged—nay, expected—to move vertically as well as horizontally. Ancestors' broad-leafed trees drip with vines, making them a sprawling dreamhouse for early humans who revert to easy prey whenever they drop down to the forest floor. But the treetops aren't exactly a haven, either: Huge raptors patrol the skies and they have a taste for prehistoric human flesh. My two-hour hands-on session with Ancestors almost ended with me burning through my small store of clan members, because I'm clearly champion matriarch material. Granted, the longer I played Ancestors, the better I got at scrambling for shelter, finding food, swinging from bough to bough, and dodging predators. Désilets tells me that's intentional. He's confident people will get a handle on Ancestors' unusually open-ended design the more they play, experiment—and fail. But what if they don't? I ask Désilets if he's sure people will stick with Ancestors. Isn't there a risk fans of modern 3D adventure games will become frustrated without maps, markers, and inventory menus? What if Ancestors proves too "open," too confusing, and players bounce off the game in large numbers? 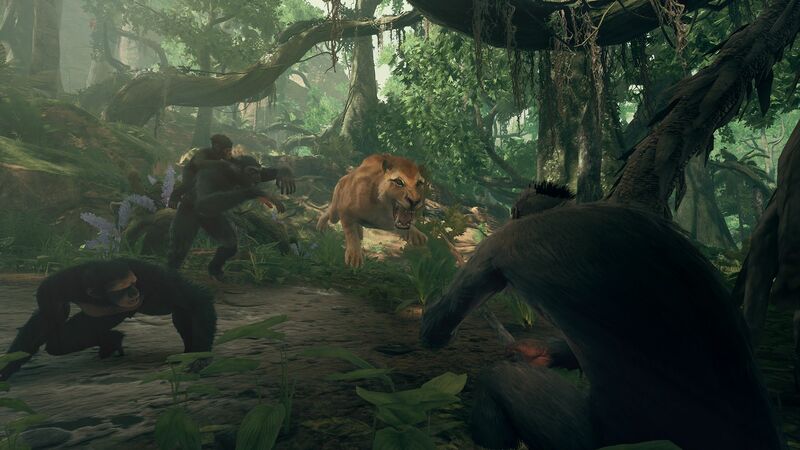 But Désilets hopes to see a robust and supportive online community build up around Ancestors, which is actually on-point for a game about primal humans working together to survive a hostile environment. "In this day and age, people go on the web to [solve problems related to video games], I feel like because we're obscure-ish, it will create a community; like, 'we love that game, we're going to help you,' [sic]" Désilets says. "We think it'll be perfect for Twitch." Ancestors' open-ended nature and the high likelihood of players having different experiences from each other does make it a good candidate for a dedicated Twitch audience. Watching an experienced player work through Ancestors will shine a light on some of the more mysterious aspects of the game, and an active chat will provide (and answer) remaining questions. After all, people love sharing character builds, and Ancestors is all about building humanity's evolution by advancing a neural network "skill tree" that gradually turns you from a half-sentient ape to a proficient tool-user. "How far do you allow yourself to go before you venture back to the safety of your clan's oasis?" and "Which skill should I evolve first?" are doubtlessly questions early Ancestors players will have, and Twitch isn't a bad place to find answers. Désilets hopes players might even go beyond streaming Ancestors to help other players. 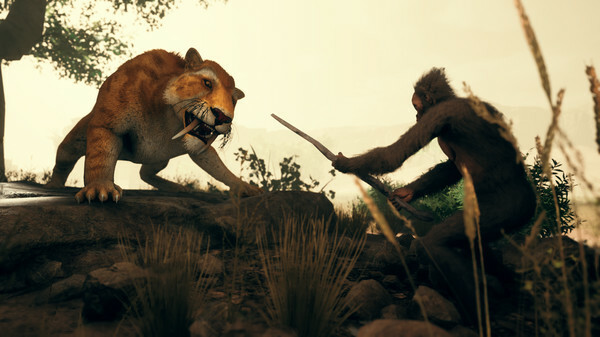 While he doesn't want to include an in-game map because doing so would defeat his challenge to survive ("I'm saying, 'Hey, homo sapiens—can you survive like your ancestors did?' If I answer for you by giving you a map, then what's the point? "), he'd love to see an amateur cartologist take up the challenge. "I hope someone will say, 'There's no map? You know what, I'll try to draw a map.'" Mapping Ancestors would be a tremendous amount of work, but surely someone who becomes invested in the game will give it a try. Despite all the recent chest-beating over the merits of finishing challenging games like Sekiro: Shadows Die Twice without the aid of cheats or an "easy mode," game lovers have poured innumerable hours into helping one another untangle obtuse games. YouTube, Twitch, GameFAQs, and dependable vanilla game guides (like our own!) show we're still willing to assist each other and solve problems that require more than one head and one set of hands. With any luck, Désilets will see that digital community come together once again to help us nurture the clans Ancestors entrusts us with. We'll see how Ancestors' digital family shapes up once the game comes out later this year. Of course, there's still a chance the response to Panache's ambitious project might turn out to be less than utopian, but Désilets shrugs over the possibility. "You know what, at the end of the day if some people don't get it, they don't get it," he says. Tagged with Action Adventure,	Feature,	Panache Digital Games,	PC,	Survival.